John Britliff is my wife’s 3x great grandfather. I have written about him twice before here and here. In a nutshell John killed his wife on 27 November 1842. He was convicted of manslaughter at Lincoln assizes on 8 March 1843 and sentenced to 10 years transportation. In fact John never left the country and he served his sentence aboard a prison ship the Warrior hulk at Woolwich. In the 1851 census John was back living in Lincolnshire. So he must have been released early from his prison sentence. In the last few weeks I found the evidence of his early release – a free pardon granted by Queen Victoria. Below are the document images from Find My Past. John Williams at Welchpool in March 1843, Hy Biggs Horn Gardener at Hereford in March 1843, Wm Martin, Geo Jarvis, Chas Martin and Hezekial Folkes at Chelmford in March 1843, Morris Thomas at Haverford West, Edward Lilburn and John Britcliffe at Lincoln in March 1843, Edward Shenton, Jas White and Thomas Johnson at Stafford in March 1843, Neil Mc Gilvary at Glasgow in September 1842 and Jas Whistow at Chester in April 1843. We in consideration of same circumstances humbly represented (?) unto us are Graciously pleased to extend our Grace and Mercy unto them and to Grant them our free pardon for the crimes of which they stand convicted. To be honest I could hardly believe it when I first found details of the pardon. Despite Internet searches I haven’t been able to find any other information about what seems to have been a whole raft of pardons granted by Queen Victoria around that time. Perhaps there was a need to create space for new prisoners – who knows. I would appreciate any information anyone might have to help me understand what was going on here. I had wondered what became of the ten children of John and Sarah and believe I have been able to trace them all. Thomas (born 1822 – my wife’s 2x great grandfather) – married Jane Johnson on 29 January 1848 at Waddingham, Lincolnshire They had eight children. Thomas died on1 July 1870 and is buried at All Saints, Wrawby, Lincolnshire. John (born c1826) – married Sarah Lancaster in 1849. They had ten children. John died in 1901 in Wrawby. Elizabeth (born 1828) – married William Greenwood on 23 June 1849 in Waddingham. As far as I can tell they didn’t have any children. Elizabeth died in January 1912 and is buried at Ulceby, Lincolnshire. George (born c1828) – died at the age of 18 in November 1846 and is buried at St Mary & St Peter in Waddingham. Robert (born c1831) – married Elizabeth Rhodes in 1856. They emigrated to Australia on 26 September 1859. They went on to have at least eight children. Robert died on 8 May 1907 in St Leonards, New South Wales, Australia. Ann (born c1834) – married Gilbert Tyson on 23 October 1852 in Waddingham. They had ten children. Ann’s death is registered in Knaresborough, Yorkshire in the September quarter of 1914. Mary (born c1836) – married John Risen on Christmas Day 1860 in Pocklington, Yorkshire. They had seven children before emigrating to Australia on 3 December 1880. Mary died in 1907 in Toora, Victoria, Australia. William (born 1839) – married Hannah Girdam on 3 May 1866. They had two children before Hannah sadly died at the age of 24 in 1868. William remarried to Eliza Brader in 1883 and they had one son. William died in Waddingham in 1913. Jane (born 1839) – married Thomas Hardy (no, not that one!!) at the age of 50 on 9 February 1890 at Holy Trinity & St Mary, Old Clee, Lincolnshire. Jane died at the age of 91 – her death is registered in the March quarter of 1930 in Glanford Brigg, Lincolnshire. Joseph (born c1840) – married Charlotte Lacey in 1871. They had two children before emigrating to New Zealand on 18 September 1874. They had four more children in New Zealand. Jospeh died on 30 June 1906 at Southbridge, Canterbury, New Zealand. So despite the terrible events of 1842 the children for the most part went on to have families of their own. Three moved to the Southern hemisphere and built lives far away. Given the wonders of the Internet and my blog I have been contacted by descendants of Robert Britliff who live in New Zealand and the family continues to thrive. Allen Simpson is my 1st cousin 1x removed – in other words my dad’s cousin. Our common ancestors are James Dawson and Emma Buckley, my great grandparents. Allen was killed in action during WW2 and in May 2012 I wrote about him here. Allen was involved in Operation Slapstick in Italy and was a casualty in the sinking of HMS Abdiel on 10 September 1943. Earlier this year I was contacted by Philip after he read my post about Allen. Philip’s father served in the same regiment as Allen and he survived the sinking of the Abdiel. Philip was taking a trip to Italy to do some research and very kindly offered to photograph Allens grave in Bari War Cemetery and to place a poppy for me. I received some fantastic photographs from Philip – see below. I am extremely grateful to Philip – I know he had a wonderful time in Italy and that it was a very moving experience. I have visited a number of Commonwealth War Grave Commission cemeteries in Northern France and it is just so emotional – the grounds are always immaculate and the atmosphere so peaceful. Thomas Musgrove is my uncle – my mum’s brother. His parents are Fred Ainsworth Stowell Musgrove and Florrie Musgrove. During WW2 Tommy was a Stoker in the Royal Navy. While home on leave in February 1942 he wrote to the local paper, the Clitheroe Advertiser and Times about Sunday opening of cinema’s. His letter was published on 13 February 1942. Sir – I would like to make a suggestion regarding Sunday Cinemas. Being a member of the Forces, I am able to fully appreciate the enjoyment derived by attending a cinema performance, or any other form of entertainment on a Sunday evening. Regarding the letter by “Interested,” in your issue dated January 30th, he stated that if only one percent were saved the necessity of occasional visits to “the local,” the proposal was justified. I am in complete agreement with him on that. We will now take for an example a young man, a teetotaller, called upon for service with the Forces, being stationed shall we say in the Clitheroe district. Being allowed to go “ashore” (as we say in the Navy), his first thoughts would be to find some form of entertainment, whereby he could occupy his few brief hours away from the hum-drum routine of the Forces. Meeting some of his friends, they would inform him that there were no cinemas open, and the young man would find himself wondering how he would spend his few precious hours. “As you know, there is no pleasure to be derived walking the streets in the black-out, whether it be wet or fine.” Meanwhile, his friends, who perchance like a drink, finally by a great amount of persuasion might induce him to “come and try one”; no doubt, feeling a bit down in the dumps, he might fall in with their suggestion. This can be used as an example of driving a man to drink. As being “ashore” say on the next Sunday, no doubt he would spend his evening by another visit to the “local.” If cinemas or any other places had been open the young man would not have fallen to the temptation. That is one side to the question. Now we will deal with the public side. There are many men and women working on jobs of national importance. As most of these Government workshops are working on “full time,” a number of people are working whilst the majority of Clitheroe people are asleep. Working on the “night shift” for a week, Sunday may become their rest day before taking over a different shift. Working through the night necessitates the greater part of the day, after which they are back again at work. After six days of night work, it would be a great boon to these people to be able to go to some form of entertainment on a Sunday evening. The managers of the three cinemas state that in their opinion the present catering for six days of the week, for the present population involved, appears adequate. Maybe they are right, and maybe they are not. Now, if we should say that each cinemas took it in turn to open on a Sunday evening, I am sure that the operators and attendants would have no objection to sacrificing one Sunday night in three, when around them so many great sacrifices are being made. I am sure that if this suggestion was given a trial it would prove a success. So let us hope some sort of provision will be made. Meanwhile everyone can still pursue their religious activities and find time as for enjoyment. It seems as though the issue of opening cinemas on a Sunday was quite contentious with strong views expressed on both sides of the argument. The Clitheroe Town Council debated a request from Military Authorities to open cinemas on a Sunday as a temporary measure under wartime regulations. At their meeting on Tuesday 16 December 1941 the Town Council approved a motion supporting Sunday opening by 8 votes to 6. In the same edition of the Clitheroe Advertiser and Times that uncle Tommy had his letter published, there was a brief article saying that “Both Houses of Parliament have now approved the Order permitting the Sunday opening of cinemas in Clitheroe. It now remains for an application on the subject to be made to the local Justices. Presumably such an application would have to be made by the cinema proprietors”. Although I haven’t been able to find out when cinemas began opening on a Sunday there are certainly adverts in the local paper for Sunday shows in late 1944. A day out in the Yorkshire Dales today looking for the gravestone of my 2x great grandparents James Paley and Mary Ann Paley (nee Spink). I knew that they were buried at St Peter’s church in Rylstone, North Yorkshire, about seven miles north of Skipton. So we set off this morning under grey clouds and rain. It’s only about an hour or so from our home and by the time we got there the weather had improved – although we got wet feet tramping through the grass in the grave yard. Anyway we found the grave and I will post a blog story and photo’s next week. St Peter’s was built in 1852-1853 to a design by the Lancaster architect E G Paley (as far as I can tell he is no relation to my Paley’s) replacing an earlier church on the site. Its total cost was £1700 (equivalent to £160,000 in 2015). The church is a Grade II Listed Building and is an active Anglican church in the deanery of Skipton, the archdeaconry of Craven and the diocese of Bradford. The churchyard contains four war graves, of a Yorkshire Regiment officer and Royal Navy seaman of the First World War and a Royal Artillery soldier and airman of the Second World War. We didn’t see those graves today so I think another visit is required. Note the obligatory grazing sheep in our rural churchyards. I thought I would try a bit harder to keep up to date with what’s happening in the genealogy world outside my own blog. So in an effort to do this I just did a simple “genealogy news” search on Google. One of the first hits I got was blog by Amy Johnson Crow asking the question Is Genealogy Blogging Dead? This is certainly an interesting read and looks at blogging alongside the rise of social media platforms like Facebook. I have to say I haven’t yet embraced or more accurately combined my blogging with social media. True, I do share my regular blogs on my personal Facebook page but these are lost among the many other posts that appear there. One blog I read that has recently undergone a makeover is My Descendants Ancestors and I know that Elizabeth, who owns the blog, also has a dedicated Facebook page and Twitter page. And I’m sure that must help with her blog’s profile and traffic. Seeing what Elizabeth does has inspired me to try to get to grips a bit more and see what I can do to improve the traffic to my blog. I generally just blog about my own family and my wife’s family – so perhaps my audience is not that great anyway. However I have made connections from distant family members who have discovered my blog and are now “followers”. I blog because I want to record and tell my family stories – I’m doing it for me and if others find it interesting that’s just great. This is another photograph from my collection of unknown people. The photograph is printed on a post card. The imprint on the reverse of the photograph is Charles Howell, Official Photographer, Pleasure Beach, Blackpool. Whoever these two fine looking gentleman are they are presumably enjoying a holiday or day trip to Blackpool. I don’t know when the photograph was taken however. I do know that some of Howell’s photographs had a very helpful date stamp on the reverse – sadly that is not the case with this one. There is quite a bit of information on the Internet about Charles Howell including this interesting blog post by Photo-Sleuth on his blog here. It appears that Charles Howell opened a studio in 1913 at Bank Hey Street, Blackpool – just behind the promenade close to the Tower. He specialised in producing novelty caricature portraits. You could be photographed wearing a top hat, playing a banjo or holding a giant bottle of beer. You could also be “snapped” on a paper mache horse or a real live donkey. However his trademark was a motorcycle (like the one above). If you follow the link to Photo-Sleuth you will see a photograph of the outside of Howell’s studio with the headline “Be Photographed on the Motor Cycle”. It’s been more than two years since I last posted a photograph in Friday’s Faces From The Past. And I have to say it feels a bit like deja vu. 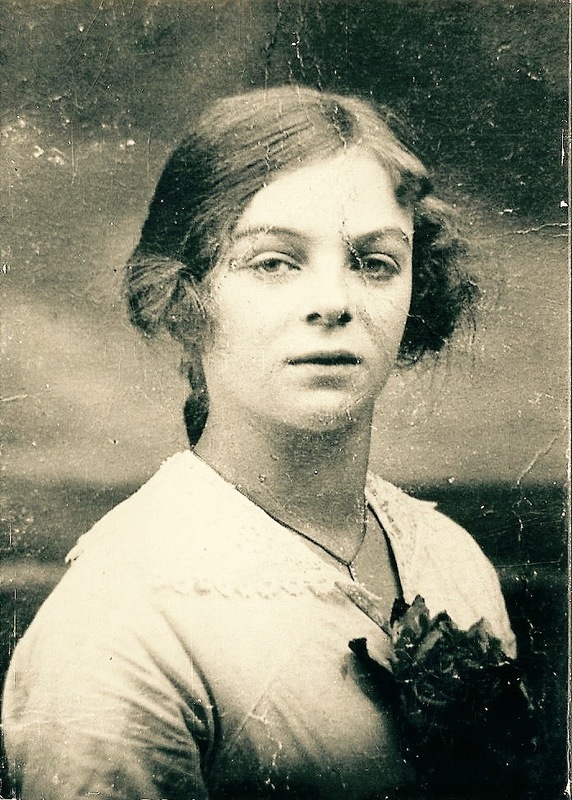 The woman in the photograph of the would be flapper girl from October 2013 (see post under Friday’s Faces From The Past category) seems to be the same woman in this new photograph. Or is it just me that can see a resemblance? I am still no nearer being able to identify her. And now I have her companion to think about. There is no ring on her wedding finger so what is their relationship? Are they a couple? Are they in love? The photograph is printed on a post card. There is nothing written on the back and no details of the photographer or where it is was printed. I suspect that the photograph was taken sometime in the 1920’s. Do you agree with me that the woman in both photographs is the same?